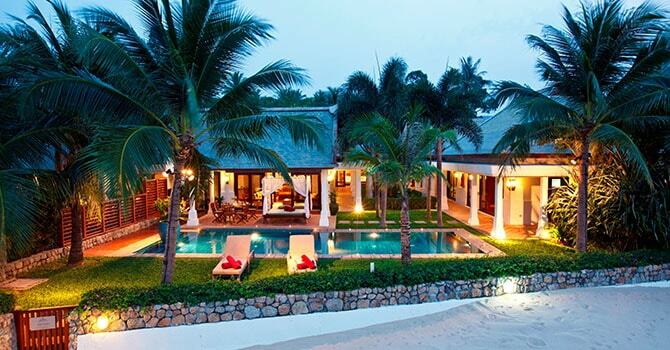 Villa Acacia is a tropical beachfront getaway ideal for families or couples. Featuring multiple pavilions that surround an exotic garden and water feature, it’s four bedrooms boast exposed timber vaulted ceilings and spectacular panoramic views of the beach. 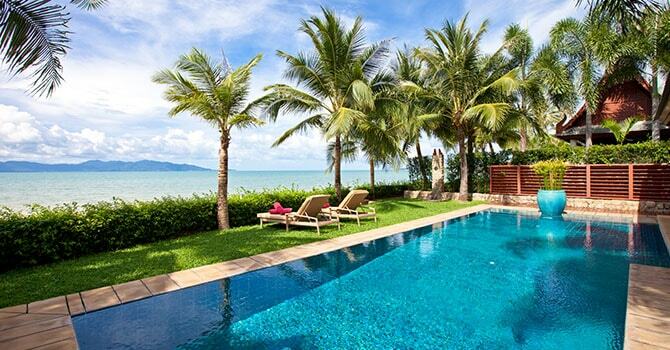 This spectacular Villa is a traveller’s dream location to party, rest, unwind or just enjoy the beauty and splendor of Koh Samui. Highlights of this magnificent property include a state-of-the-art media room and a stunning blue-tiled swimming pool that overlooks turquoise seas and white sands. Stylish artwork and chic furnishings adorn the open and modern concept providing a comfortable and chic environment for your vacation between gorgeous walks on the pristine beach just steps from your door. This slice of paradise is the perfect retreat to reset and experience the soothing island environment. 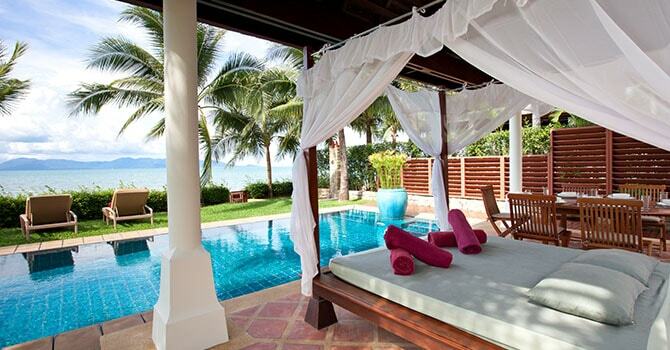 The villa is located in ever-popular Maenam Beach, just metres from the soft white sand. 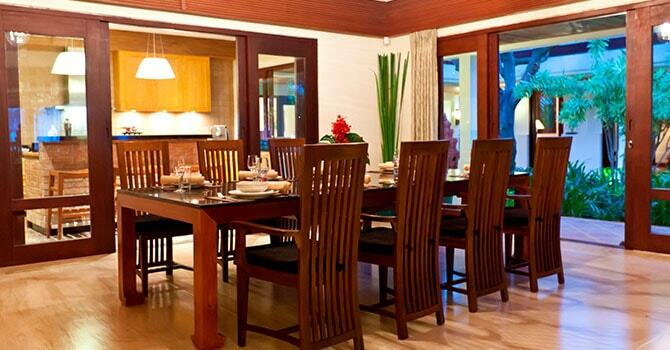 Many excellent restaurants are nearby along the beach, while other attractions are a short drive away. Enjoy 15 % discount for min 5 nights booking for travel period between 13-Apr-2019 to 28-Apr-2019. Remark:Availability and conditions apply, please inquire with reservation. Promotion is only valid to new reservation after the start of the promotion. Not valid with any other discount and promotions combined. Each of the maximum of four bedrooms in the luxury villa are superbly decorated, fusing modern style and traditional charm to create beautiful, tropically inspired rooms all bathed in natural light. Two of the bedrooms feature deluxe king size beds, while a further two have twin beds. Each room also features its own luxurious ensuite for privacy and convenience. 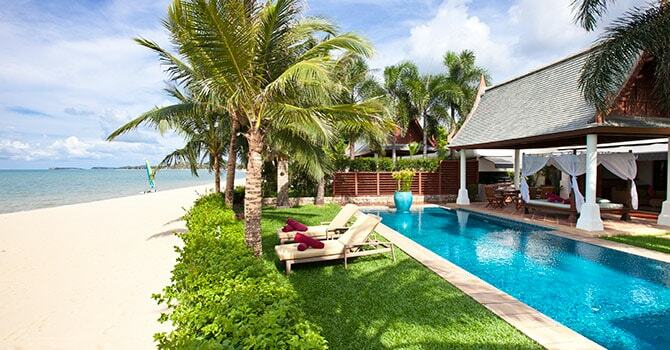 Our stay in Villa Acacia & Villa Frangipani has been a very positive experience. Nim our Villa Manager really made the different as well in being very professional. I would say keep up the good work and high standard!